Perfect for summer or any season, this natural body scrub will leave you feeling smooth, soft and moisturized! 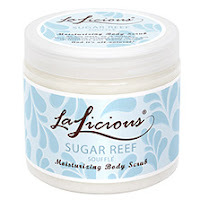 Sugar Reef Souffle Scrub is made with coconut oil which absorbs quickly and easily into your skin, leaving it moisturized and protected without feeling greasy. Pure cane sugar crystals exfoliate dead skin cells while sweet almond and vitamin-e oils condition, moisturize, and smooth you to perfection! No need to apply a body moisturizer after this yummy smelling body scrub. You can even use it to shave! Your skin will feel SO soft and smooth, and you'll just love the glowing sheen it leaves behind. Get yours at b-glowing.com.